Anderson Hays Vanderbilt Cooper (born June 3, 1967) is an American journalist. He is an anchor on CNN. He hosts Anderson Cooper 360° and the syndicated daytime talk show, Anderson Live. Cooper was born in New York City. His mother is Gloria Vanderbilt; his father was Wyatt Emory Cooper. Cooper's great-great-great-grandfather was Cornelius Vanderbilt, a 19th-century American businessman. On July 2, 2012, Cooper came out as gay. Anderson Cooper at the inauguration of President Obama in Washington, D.C., 2009. 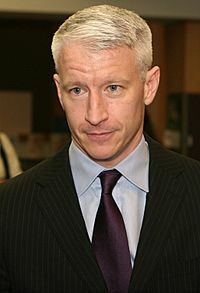 Anderson Cooper at the 71st Annual Peabody Awards (Astoria Hotel, 21 May 2012). Anderson Cooper Facts for Kids. Kiddle Encyclopedia.